Natural salts gathered from the salt ponds of the Atlantic Ocean surrounding the coast of France. Three of the most common varieties available are known as Fleur de Sel and Sel Gris. Fleur de Sel sea salts are removed from the surface waters of the ponds resulting in a thin, delicate salt crystal resembling a snowflake. Unlike the French sea salt harvested in the same area referred to as Sel Gris, Fleur de Sel has a whiter and somewhat translucent appearance. Considered to be an exceptional and higher quality salt crystal, Fleur de Sel is often used as a seasoning for meats, poultry, fish, vegetables, and a variety of food dishes, providing a very delicate and somewhat earthy flavor that may also be slightly sweet. Commonly referred to as grey or gray sea salt, Sel Gris is harvested from waters below the surface that have passed through multiple clay basins, resulting in a higher concentration of minerals such as calcium, iron, zinc, magnesium, manganese, and potassium, as well as a light grey mineral coloring. Colored gray by the chemical deposits of the minerals in the salt beds, this salt is harvested primarily in the Brittany region of France as the water evaporates from moist basins leaving the crusty saline as residue. 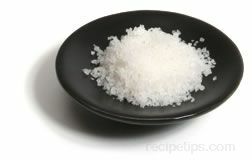 Gray salt is an unrefined form of salt sought for it purity and rich natural sea flavor. It is favored as a seasoning for cooked vegetables, greens and many different food dishes.